The stereotype of hybrid cars is slowly becoming obsolete as more vehicles are offered with hybrid options. 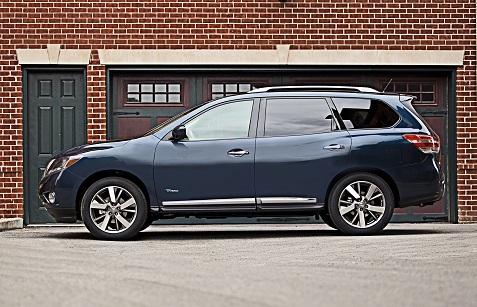 With the 2014 Nissan Pathfinder Hybrid, consumers can now purchase a full-sized CUV with real towing capacity while enjoying the improved gas mileage offered by hybrid vehicles. Sure, you won’t approach the MPG numbers of smaller hybrid vehicles, but you’ll you’ll have a real advantage over gas-powered large vehicles. I traveled to Nashville and had the opportunity to drive the new Pathfinder Hybrid and came away impressed. When driving the vehicle it feels very much like the gas-powered version. The Hybrid was designed to introduce the new hybrid powertrain system to enhance fuel economy and reduce CO2 emissions but with no reduction of driving performance, passenger roominess or cargo capacity. The designers used a space-saving Li-ion battery fitted under the 3rd row seat which preserved Pathfinder’s 2nd row sliding functionality and easy access to the 3rd row. You get all of the roominess and comforts of the new Pathfinder without making sacrifices for the hybrid technology. 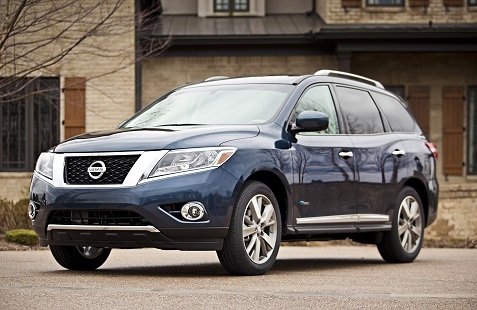 The Pathfinder’s standard 3.5-liter V6 is replaced in the Hybrid by a new supercharged 2.5-liter gasoline engine and an electric motor paired with a compact Lithium-ion battery. The 15 kW electric motor and gas engine were designed to work in tandem to provide performance similar to the conventional Pathfinder. The Hybrid system is rated at 250 net horsepower and 243 lb-ft of torque while the 3.5-liter V6 has 260 horsepower and 240 lb-ft of torque. These similar numbers are evident in the driving experience when you compare both vehicles. 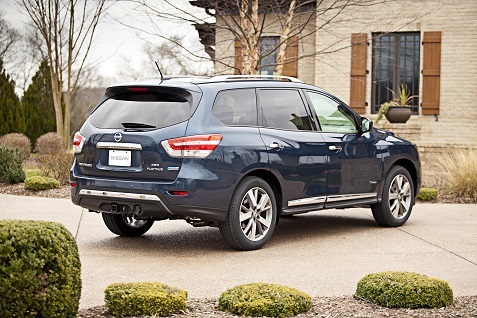 The result, however, is improved fuel economy as the Hybrid is rated at 26 MPG combined (25 city and 28 highway), an increase of 24 percent over the standard Pathfinder. Like the gas model, the Pathfinder Hybrid has a large 19.5-gallon fuel tank for a highway driving range estimated at more than 546 miles. These MPG numbers won’t challenge smaller vehicles but have to be evaluated in light of the size and performance of this vehicle. For example, the hybrid can tow up to 3500 pounds when properly equipped which is less than the gas-powered Pathfinder’s 5000-pound towing capacity but is still very useful. Like all hybrids the Pathfinder has a regenerative braking system that automatically recharges the battery by converting the vehicle’s kinetic energy that would be otherwise lost in braking. Still, I would have liked to see more features in the dashboard gauges showing me how well I was using this system and the electric motor as these features are a big selling point in other hybrids. The Pathfinder Hybrid offers an appealing option for consumers looking for a large vehicle, as now you can get all the benefits without being stuck with a gas guzzler. Take it for a test drive and you’ll see immediately that you’re not sacrificing performance or comfort for the gas mileage boost.